I’m standing on the old Edo trade route, or Kisoji, on the way to Tsumago. Gill is shrieking at me, her face a mask of horror. This is our second day in Japan, after leaving Sydney, and we are walking the lovely old road from Magome. The weather is beautiful – immediately after the chilly autumn of Australia, we have flown straight into the late spring of Japan, where, here in the mountains, the cherry blossom is heavy on the trees. I was apprehensive about the Japanese part of the journey – and the autumnal Sydney day had a back-to-school feel. But I had an email from someone called Owen, apparently from Lewes, who’d seen my blog on VivaLewes, and is currently living in Sydney. In fact, coming to King Street in ten minutes! We met in the street, and of course, I know his father. He knows our son. A small world, indeed. He told us about his life in Sydney, learning to be a baker, fruit-picking in Orange, living eco-consciously, and enjoying life. A very impressive young man. 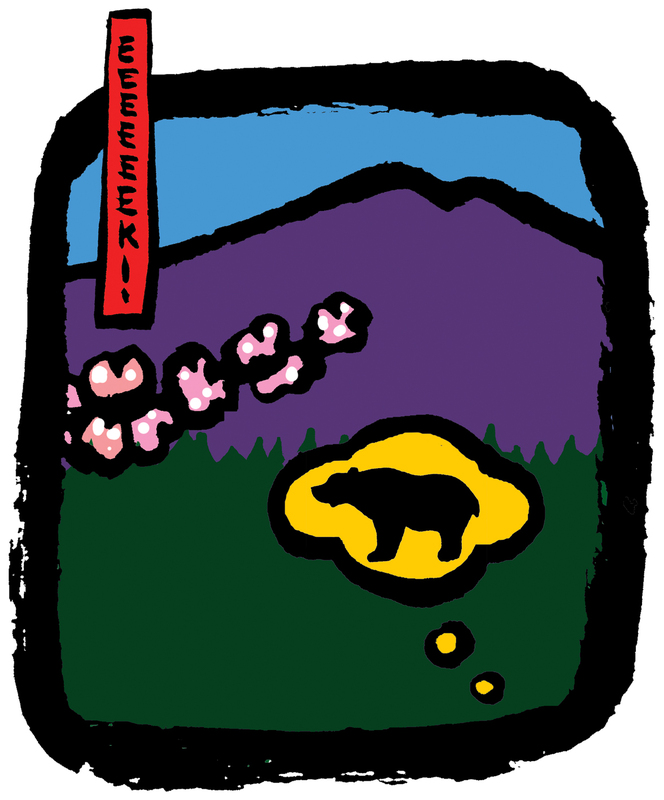 The only drawback about this Kisoji trail seems to be the bears. It’s easy walking, the signs are very explicit, parts of it are even paved. But every kilometre or so through the woods, there’s a brass bell hanging, with a sign that tells you ‘Ring the bell hard Against the bears’ (sic). There are black bears roaming the woods and we really don’t want an encounter. So we ring them really hard and hurry on to the next bell. So – Gill is yelling my name at me while I’m thinking about the bears, but I’m on a wide paved bit of the path, and I can’t think what the matter is, until I see her pointing at my feet, and I suddenly get the dread realisation that I am, in fact, standing on a five-foot long green snake. And I do a sort of strangled gulping scream of my own and a sort of shuddering, scissor-kick little jump sideways – and the snake slithers off into the ditch. On the Kisoji there are also well-appointed toilets from time to time; and yes, they have heated seats.